The "Take It!" came as we were driving on our way to our second stop on the route. 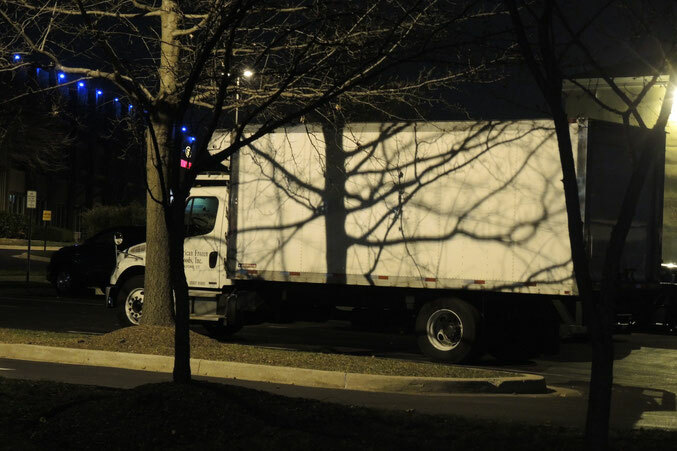 The shadow of the tree on the side of the truck was so vivid that it seemed as if it had been painted onto the vehicle. Shadows rarely are so bold in contrast. Most are a bit diluted from outside light filtering into the image. Again - this one was jet black and distinct in every way. I think if there was a way to freeze this image onto the truck and cut the side out with it being held intact - it would make a wonderful wall hanging. The After Take: Everyone that I showed this to seemed to get caught up in the clarity of the shadow's image. For as common as the background is, in the form of the truck - all enjoyed it. Simplicity sometimes brings high satisfaction. It looks like an intricate set of veins branching off a large artery. Ya I would probably hang something like that on my wall. Itd be pretty cool to head out there with some black paint and paint on the shadow. Its like a stencil already laid out onto a canvas. I sat down to look at your newest posting and looked at the picture and thought, "hmmmm how unlike him to post an extremely blurry photo." I then went to read the story below which was also blurry. At that moment it occured to me, my glasses were around my neck and not on my eyes. Problem solved! Great picture! Has kind of an eerie and creepy feel to it.